UPDATED: Fri., Aug. 24, 2018, 7:35 p.m.
SEATTLE – Believe it or not, Washington won’t be the only top-10 football team taking the field inside Mercedes-Benz Stadium on Sept. 1. As game week approaches, it’s finally time to turn our focus toward No. 9 Auburn, the defending SEC West champion and aspiring College Football Playoff contender. Gus Malzahn’s Tigers finished 10-4 in 2017, dropping their final two games – both coincidentally inside Mercedes-Benz Stadium. Senior linebacker Deshaun Davis said that publicly during SEC Media Days, and he might have a point. The Tigers return three of four defensive line starters from 2017 and eight players who appeared in the two-deeps last fall. That includes standouts Dontavius Russell (46 tackles, 6.5 tackles for loss and three sacks in 2017), Derrick Brown (56 tackles, nine TFL, 3.5 sacks) and Marlon Davidson (43 tackles, 6.5 TFL, 3.5 sacks). Those numbers are comparable to Washington senior Jake Browning, who completed 68.5 percent of his passes, throwing for 2,719 yards with 19 touchdowns and five interceptions last fall. 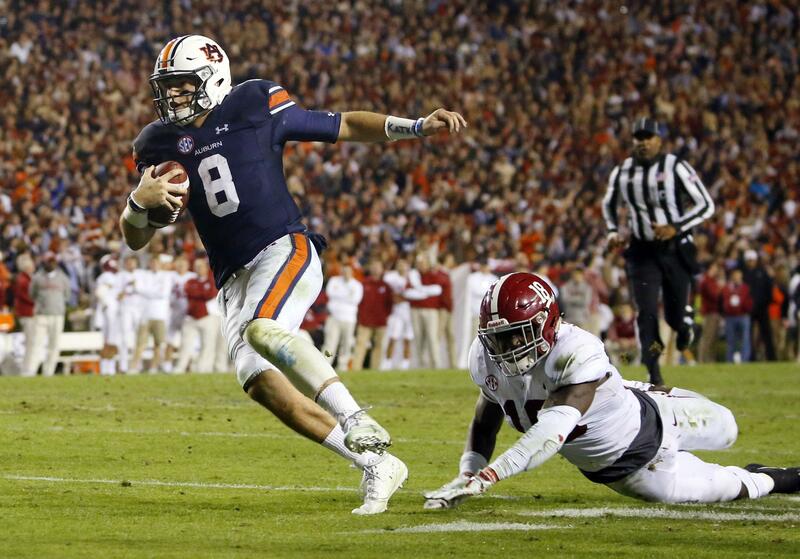 The expectation for Auburn is that Stidham will take another step forward in his redshirt junior season, perhaps even landing in the Heisman conversation. Still, it will be difficult for anyone – even Stidham – to dissect the Washington secondary. Next weekend, the Tigers will roll out a running back tandem of Kam Martin and JaTarvious Whitlow, both of whom remain relatively unproven. Specifically, let’s talk pass protection. In 2017, the Tigers surrendered 2.57 sacks per game, which ranked 101st nationally. Their 6.43 tackles for loss allowed per game ranked 93rd. Gone is place-kicker Daniel Carlson, the leading scorer in Auburn history. Through spring and fall practices, Anders – a 6-foot-5, 210-pound redshirt freshman – has earned rave reviews. Still, there’s no telling how he’ll react to his first legitimate dose of college football. Here’s one, for example: Who are these guys? Proven contributors Carlton Davis, Tray Matthews and Stephen Roberts are gone. Cornerback Jamel Dean (43 tackles, eight pass breakups and 2.5 TFL in 2017) could be a budding star, and junior Jeremiah Dinson returns to bring some semblance of stability to the safety spot. But beyond that, there are few established certainties. The 5-9, 185-pound senior is Auburn’s undisputed No. 1 wide receiver, fresh off a 2017 season in which he led the Tigers in catches (84), receiving yards (815) and receiving touchdowns (five). As a result, he was named to the preseason All-SEC second team by both the coaches and the media. Still, don’t expect the Washington secondary, which allowed just 10 touchdown passes in 13 games last season, to be intimidated. The Tigers still use it. When they use it, they use it well. According to the Montgomery Advertiser, Auburn ran 51 plays out of the wildcat last season, averaging 5.57 yards per play. Even more impressive, nearly 55 percent of those plays resulted in either a first down or a touchdown. Without Kerryon Johnson, the most likely candidate to take the wildcat reins this fall is redshirt freshman running back JaTarvious Whitlow. Dig your hand into the bowl of mostly irrelevant historical statistics, and pick out the one you like. Auburn is 1-7 in season openers against ranked opponents. Oh, and the lone win came in 1957. Malzahn is 3-5 in nonconference games played away from Jordan-Hare Stadium, and in the midst of a three-game losing streak. Published: Aug. 24, 2018, 4:46 p.m. Updated: Aug. 24, 2018, 7:35 p.m.